Milan's Cigar of the Month for April is Black Market! Alec Bradley's Black Market cigars are handmade in Danli, Honduras, with a blend of Panamanian and Honduran fillers, Sumatra binder, and a beautiful, oily Nicaraguan wrapper grown in Jalapa. These cigars are medium-bodied with a great aroma and balanced, complex flavors of spice, earth, and citrus. 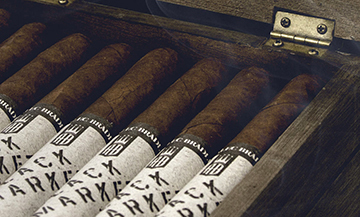 Black Market cigars are packed in small crates of 22 just like contraband, but we can assure you they're perfectly legal and well worth buying.